2. 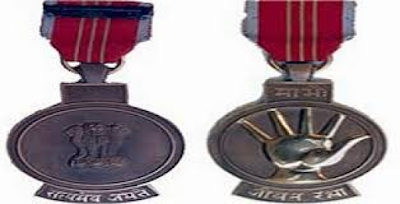 Jeevan Raksha Padak series of awards are given to a person for meritorious act of human nature in saving the life of a person. The award is given in three categories, namely, Sarvottam Jeevan Raksha Padak, Uttam Jeevan Raksha Padak and Jeevan Raksha Padak. Persons of all walks of life are eligible for these awards. The award can also be conferred posthumously. 3. The decoration of the award (medal, certificate signed by the Union Home Minister and lump sum monetary allowance) is presented to the awardee in due course by the respective Union Ministries/Organizations/State Government to which the awardee belongs.